Last time we introduced Weibull analysis. Let's now derive the relationships needed to calculate the slope, beta, and characteristic life, eta. F(t) is the cumulative fraction of fails, from 0 to 1. 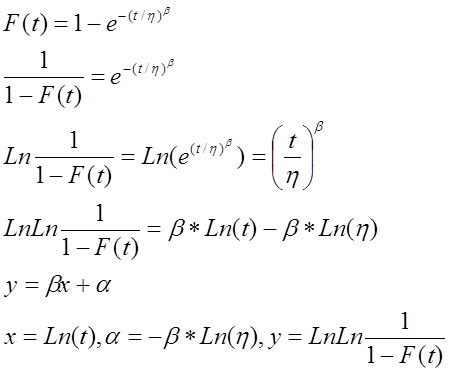 By choosing Ln(t) as x and LnLn 1/(1-F(t) as y, we would expect a straight line. See the derivation above. It can be shown graphically that this fact is so. So if we plot F(t) versus t on logarithmic graph paper, the slope of the line will be beta. To determine eta, let t=eta, in the first equation below. The result is F(t) = 1-e-1 = 0.632. So the time at which 63.2% of the parts have failed, is eta, the characteristic life. Let’s consider some data comparing SAC305 and SACm® (SAC105 with about 0.1% manganese) BGA solder balls in thermal cycle testing. The primary test vehicle employed was a TFBGA with NiAu finish mounted on PCB with OSP finish. SACm® is a new breakthrough soldering alloy that has better drop shock resistance than SAC105 and comparable thermal cycle performance to SAC305. The data follow. 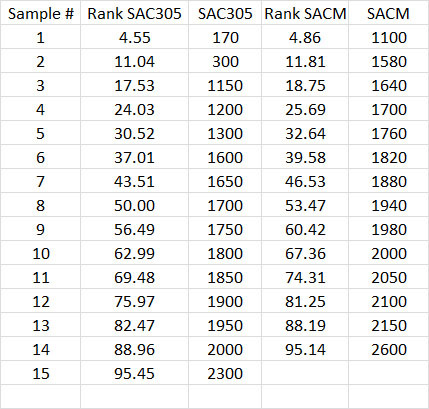 The first column is the sample number, the third and fifth columns are the number to thermal cycles to fail for SAC305 and SACm®. The second and forth columns are rank of the sample number. One would think that the first number in the second column would be 100*(1/15) =6.67%, as it represents the cumulative percent of samples failed, but a slight correct factor is needed. By plotting the log log of rank as shown above (LnLn1/(1-F(t)) vs log of cycles at failure, we get the Weibull plot. The slopes of the best fit line is equal to beta and the number of cycles at rank = 63.2% is eta. 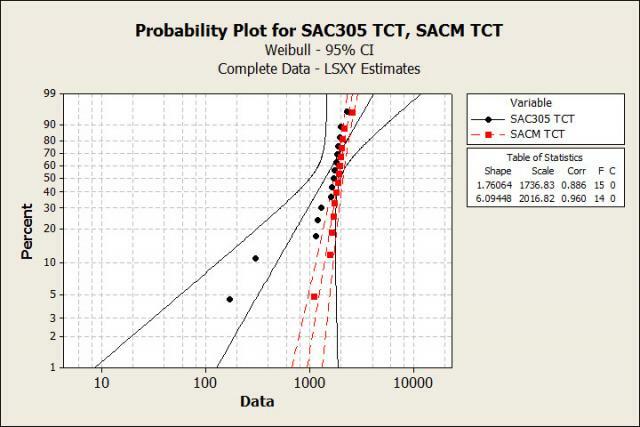 We see that the shape (beta) for SAC305 is 1.76 and that of SACm® is 6.09, the scale or characteristic life (eta) is 1736.8 and 2016.8 respectively. These results are a strong vote of confidence for SACm®. Its steep slope (high beta) suggests a tighter distribution, with more consistent solder joints and its characteristic life (eta) is also slightly greater. I plan on teaching detailed workshops on this topic. I will keep you posted.